“It would be a beautiful world if you can go to a dealer ... with zero floorplan [expense],” Audi of America President Scott Keogh said of the e-tron. SAN FRANCISCO — The e-tron, Audi's first full-electric vehicle, will be available in the U.S. in mid-2019 with a 95-kilowatt-hour battery, some nifty electronic gadgetry and a competitive price tag. But what it won't have is a ton of back-end costs for Audi dealers. Audi of America is trying a new retail model with the five-seat, all-wheel-drive crossover. Instead of the brand's 303 U.S. dealers carrying inventory, they'll handle customer reservations for the e-tron — held with refundable $1,000 deposits. That could help Audi and its retailers accomplish what few others have been able to do: consistently sell electric vehicles at a profit. A lot hinges on the experiment. Other full-electrics are expected to follow the e-tron into Audi's lineup, beginning in 2020. 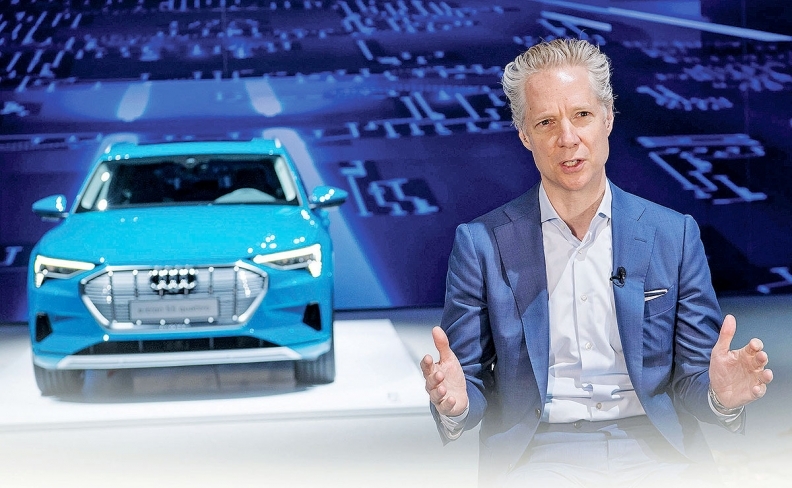 "I think it would be a beautiful world if you can go to a dealer — and we'd like to find that beautiful world — with zero floorplan [expense] and proper, full gross on the car," said Audi of America President Scott Keogh. "This would be a beautiful state; so let's go see if we can find this dream state." At the e-tron's unveiling here last week, Keogh told Automotive News that Audi's proven dealer network gives the brand a significant advantage in competing with other premium EVs, including Tesla's Model X. "The same network that got us to double our sales, and got us to 200,000 units [annually], is going to be the same network that's going to lead this electric revolution for us," Keogh said. "And that's a massive competitive advantage — an onboard and engaged network." He said every Audi dealer will be able to sell the e-tron without having to worry about allocation or whether the factory got its sales projections for each dealership right. Reservations and deposits can be made online through audiusa.com or in person at a dealership. Keogh said the time a customer waits for delivery will depend on global demand, and it could stretch for months or even a year or more. All e-trons will be built at Audi's assembly plant in Brussels. 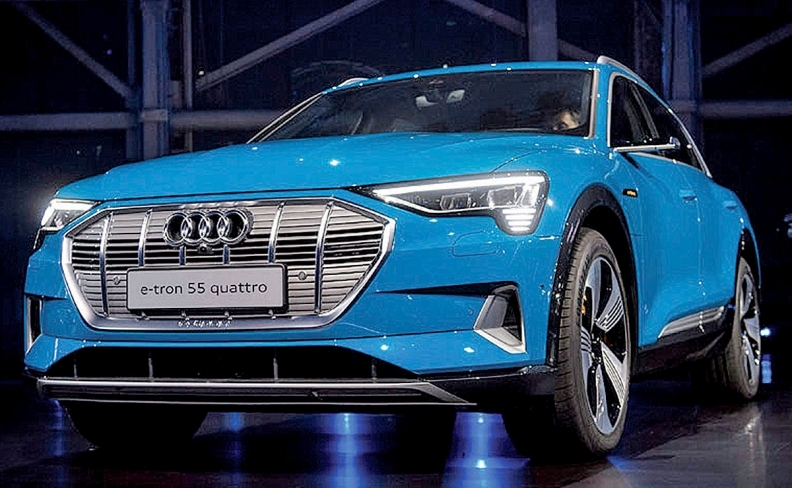 An Audi spokesman later clarified that, if e-tron production exceeds existing reservations and orders, e-trons would be available for U.S. dealers to keep in stock to sell on demand. U.S. Audi dealers also have the option of ordering e-trons for their own inventory, should they wish to do so, and will have demonstrator models on hand for shoppers. The Audi e-tron will come in two trims and a special First Edition model. The 2019 e-tron will have a range of just under 250 miles, based on the Worldwide Harmonized Light Vehicle Test Procedure used in Europe. It will come in two standard trims as well as a special First Edition model limited to 999 vehicles. Pricing starts at $75,795 for the base Premium Plus trim and jumps to $82,795 for the higher Prestige trim level. The First Edition model has a starting price of $87,695. All prices include shipping. The e-tron employs a pair of cooled asynchronous motors attached to single-stage transmissions to deliver torque to the e-tron's axles. When the crossover is operating at moderate speeds under a light load, power primarily comes from the rear motor and axle. When it is coasting, both motors operate free of magnetic drag torque, increasing efficiency. Ride height can be automatically adjusted up to 3 inches, lowering at highway speeds to reduce drag. Body height also can be raised by the driver to increase clearance or make it easier for passengers to get in and out of the vehicle. When equipped with an optional tow package, the e-tron is rated for as much as 4,000 pounds, Audi says, though its battery range would be limited under such a load. The e-tron is capable of both AC and DC charging, including DC fast-charging of up to 150 kW at some high-speed charging stations — enabling up to 80 percent of the battery to be charged in about 30 minutes, Audi says. For home charging, the e-tron will come with a 9.6-kW capsule charger that can be plugged into either a 240-volt or 120-volt outlet. Audi says it will partner with Amazon Home Services for home electric charging installations. Inside the cabin, two centrally mounted control touch screens — one 10.1 inches and the other 8.6 inches — are used for the infotainment system and cabin controls, while the instrument cluster features a version of Audi's adaptable screen display, allowing a more integrated map with Google Earth images. Notably, the center tunnel includes a standard Audi phone box to allow for inductive cellphone charging. Navigation is standard and comes with a special route planner when paired with Audi's Connect Plus subscription service that suggests routes with available charging points. The navigation system considers traffic conditions as well as the battery's current charge and required charging time when calculating arrival time. An optional driver-assistance package features adaptive cruise assist, helping with accelerating, braking and lane-keeping in heavy traffic or at highway speeds. In urban settings, the e-tron has a parking-assist feature to help with both parallel and perpendicular parking.